On June 29 for one day only you can sail from Menai Bridge and Caernarfon to Cruise Round Anglesey. Book now to secure your space onboard for this very special trip! 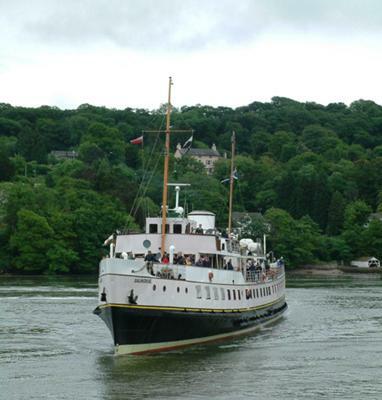 Departing from Menai Bridge at 11:30 and Caernarfon at 12:15, you can enjoy this cruise for only £31 for Adults and £29 for Senior Citizens! Recapture happy memories or create new ones as you sail under the Brittania Bridge, view the wildlife on Puffin Island or simply admire the wonderful scenery as you relax on deck with a refreshment! Balmoral has excellent onboard facilities including a restaurant, two bars, heated lounges, and souvenir shop. Children aged 5-18 are half the adult fare and children under five travel free. Receive a 10% discount for groups of 10 or more! To receive a brochure or book tickets call the Booking Office on 0845 130 4647. Now this is something which was made during the 80s if I am right. But I do not think it can be of great use to the people in any manner. This is just history and its sick rules that one should even follow now. Towards Trearddur Bay we went, and we wondered if we would be close to a dangerous rocky outcrop near Rhoscolyn. South Stack lighthouse was a great sight and of course we don't normally see it from such a different angle. Then to starboard was the North Stack fog station and Holyhead breakwater snaking its way out into Holyhead Bay. We passed two ferries making their way between Dublin and Holyhead, but we weren't ever going to collide. The crew were very friendly, they were from Latvia. It must have been hard work, as I reckon there were around 700 of us onboard. Then we went through the gap between Skerries and Carmel Head - or that is what my OS map said it was! Very tidal here, you could see the speed of the ship over the land increase. The north coast of Anglesey seems very different to the south and west of the island. More rocky, smaller coves. We saw Point Lynas lighthouse which I believe is up for auction. A great view from there i am sure. Then we sailed by Dulas and were told that a maid used to leave food in a small tower on this isolated rock, for the benefit of mariners in distress. Great views of the coast from Moelfre down to Benllech and the high gtound near Llanddona, with again lots of tree coverage. We headed for Puffin Island and Penmon Point, and passed between the island and Trwyn Du Lighthouse, again this bit was tidal. The it was on to Beaumaris where there were quite a few sailing dinghies out. We would thoroughly recommend this trip as a great way of getting a different perspective of Anglesey and its many natural assets. A lovely day to enjoy a beautiful coastline. We had a great day on Tuesday as we set off around Anglesey on the Balmoral. It was an early rise at 6 for us so we could drive from Manchester to get to Menai Bridge in good time for the departure. We were worried about it being a really wet day because it was raining heavily the night before. As luck was on our side, about half an hour before we set sail, the sun broke through the clouds and we could feel it getting warmer. Passengers with rucksacs full of food and drink were eagerly making their way to the gangway for boarding. We left around 1120 from the small harbour at Menai Bridge and passed under the amazing Telford Suspension bridge and past a small island in the middle of the Menai Strait. Then we sailed under the massive Britannia bridge built by Stephenson, which carries cars and rail today. As we looked towards Anglesey we saw the lovely gardens at Plas Newydd and a small column on the shore which looked like Admiral Nelson. Then we stopped at Caernarfon to pick up around 50 passengers and then the ship made progress towards the Caernarfon Bar, which someone told me can be quite tidal and choppy. It was lovely watching the seabirds gliding along the water and the Snowdon range in the distance to the east. It was a little misty as we sailed up the west coast of Anglesey, though we could see Llanddwyn island and the beautiful long sandy beaches, with the thick conifer coverage of Newborough Forest in the background. All along this stretch we saw nice green sweeps of coast broken with sandy inlets and above, a smattering of white cubes - the well positioned coastal cottages, which are many on this island. some friends said they went on this ship a few years ago.